This official Blackmagic Design training course provides a comprehensive overview of the tools and functionality available in DaVinci Resolve and DaVinci Resolve Studio - the premier tool used to finish many Hollywood feature films. The general overview training covers specific lessons in setting up your DaVinci Resolve editing system, importing and organising your media, general editing functions and solid overviews of the Fusion, Fairlight and Color Pages and is useful for those who are new to working with DaVinci Resolve. This training is suitable whether you are editing using the free version of DaVinci Resolve or DaVinci Resolve Studio. 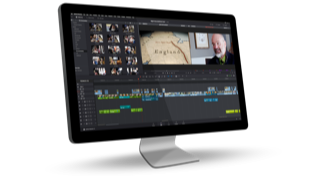 More advanced training is also available that covers specific aspects of working with DaVinci Resolve; including editing, motion graphics and compositing in Fusion, audio post-production in Fairlight and colour correction and grading. This training is generally suitable if you are working with DaVinci Resolve Studio.